Update: Dr. Aisha Al-Manae was released from custody on 23 May 2018 after becoming ill.
Update: An additional name, Ibrahim Fahad Al-Nafjan, has been revealed among 12 human rights defenders arrested (including one anonymous man) in the past week in Saudi Arabia. Since 15 May 2018, Saudi authorities have detained eleven advocates for women’s rights, including leaders and supporters of the #Right2Drive and #IAmMyOwnGuardian campaigns. Seven people of those detained - three women and three men - have been publicly named and branded as traitors, along with a seventh un-named man (see graphic at left above). The Gulf Centre for Human Rights (GCHR) is particularly concerned that Loujain Al-Hathloul, a well-known women’s rights defender on social media, is currently the only one held incommunicado as of 20 May. Shortly after her return from attending a review session of Saudi Arabia at the United Nations Convention on the Elimination of all Forms of Discrimination Against Women (CEDAW), Al-Hathloul was arrested by Emirati authorities in Abu Dhabi and brought by the Saudi authorities to Riyadh in early March 2018 for interrogation. She was released after three days and placed under travel ban until her recent arrest from her home on 15 May. She has had no contact with her family, unlike the other detainees. Al-Hathloul was previously detained on 01 December 2014 for 75 days and again in June 2017, for her advocacy on the women’s driving campaign and abolishing the male guardianship campaign. Among the others arrested are Dr. Eman Al-Nafjan, assistant professor of linguistics, author and a blogger for the Saudiwoman's Weblog. She has previously protested the driving ban, including publicly driving in Riyadh in 2013, and was harassed and interrogated. GCHR reported her arrest on 18 May. 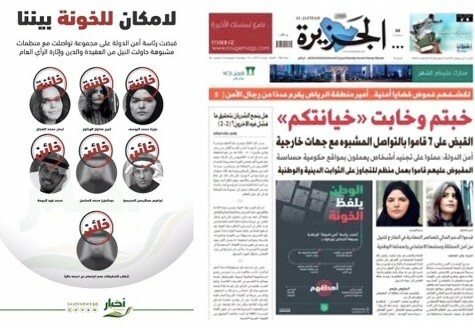 It has been revealed that among the others arrested are Aziza Al-Yousef, a retired lecturer and a prominent campaigner for the right to drive and to end the male guardianship system who defied the driving ban in Riyadh in 2013 and was previously harassed and interrogated; and three men supporters of women’s rights campaigns; Dr. Ibrahim Al-Modaimeegh, a Harvard-graduate lawyer who supported women’s rights defenders and other human rights defenders in legal representation; Mohammad Al-Rabea, a writer, and a youth cultural activist, and Abdulaziz Al-Mesha'al, a businessman and philanthropist who was listed as a board member in the application for an NGO to protect women survivors of violence, that is still in progress. The other detainees who were not publicly announced are Dr. Aisha Al-Manae, Dr. Hessa Al-Sheikh, Madeha Al-Ajroush, and Wala'a Al-Shubba, who took part in the first women’s protest movement for the right to drive in 1990, in which 47 women were arrested for driving and lost their passports and their jobs; all are academics and professionals who supported women’s rights and women’s survivors of violence. The Saudi authorities have announced that they're being charged with: "organising for trespassing the country’s religious and national foundations, suspicious communication with foreign entities recruiting people working in government positions, funding hostile groups abroad to undermine Saudi national security, stability, social peace and to destroy the social cohesion." These charges are considered treasonous. It is unclear which foreign entities the rights defenders are being accused of being in touch with, but a related hashtag describing them as “Embassies’ Clients” (عملاء_السفارات) has been circulated on Twitter. The arrests are shocking on two fronts – that those arrested are being named publicly (because they are usually reported as anonymous), and that they happened just six weeks before the ban on women driving in Saudi Arabia (the only country in the world to ban women from driving) was scheduled to be lifted in June. A Royal decree was issued in 2017 announcing that women would be allowed to drive in 2018, offering the illusion that Saudi Crown Prince Mohammed bin Salman was a progressive. However, following the announcement, women’s rights activists were specifically warned by the royal court to remain silent and told not to give media interviews or post on social media. Subsequently, several human rights defenders were placed under travel ban during the past year, which raised suspicion of potential arrest. It’s alarming that Al-Hathloul was transferred to Saudi Arabia against her well, which is part of the security agreement in the Gulf Cooperation Council (GCC) countries, which leaves human rights defenders and critics at risk anywhere in the region. Guarantee in all circumstances that all human rights defenders including women’s rights activists in Saudi Arabia are able to carry out their legitimate human rights activities without fear of reprisals.